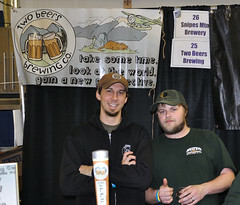 Belgianfest is a chance for Washington breweries to experiment a bit and show off their skills with Belgian-style beers. That general heading might include wood-aged sour beers, dubbels, tripels, strong ales, and more. This festival is quite unique, as some of these breweries don’t typically make Belgian-style beers for their regular lineup. It’s a great opportunity to try some beers you might not see anywhere else. American Brewing Big Pucker – Skip has been nurturing a barrel-aged sour beer for Belgianfest. It’s a double Flanders sour ale aged in an oak Cabernet Franc wine barrel. Big Time Brewing Jack Candy – The Jack Candy Grand Cru is a Belgian-style strong pale ale fermented with two yeast strains, Westmalle and Achouff. Sixtly pounds of amber candy sugar was added to the last 30 minutes of the boil. It features Saaz hops, which lend a nice spicy character to the beer. 9.3% ABV. Big Time Brewing Black Jack Candy – Drew and Bradley took the Jack Candy Grand Cru and added Northwest blackberry puree post fermentation. Boundary Bay Tripel – Boundary Bay does not typically brew Belgian-style beers, but they created this Tripel for the first Belgianfest three years ago and it is back for a return appearance. Their tripel is golden in color, medium bodied and moderately hopped. The flavor and aroma are both dominated by alcohol and Belgian yeast. The beer has a nice malt backbone, is slightly earthy and has a dry finish .9.5% ABV. Paradise Creek Brewery Tien A – A Belgian-style amber.